The Reluctant RoVer: The Reluctant Boater? When we bought our first RV at the end of 2010, I became the Reluctant Rover. Will I now become the Reluctant Boater? I hope not; I really do want to go out in our little bass boat and catch dinner. 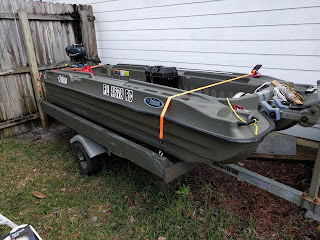 In between other projects around the house, Jim has worked on the boat--wiring it for lights, putting in accessories, etc. Then he tackled the motors. The larger motor is ancient: It was built in 1972 and sold under the Montgomery Ward brand! But would you believe? It starts on the first pull, every time. One little problem...it only goes in reverse. So, Jim decided to use the smaller motor. He had to replace the gas line and filter, but he got it to work. So, yesterday afternoon we took the boat down to a public boat ramp and put it in the water. We managed to get the boat into the water without any trouble. Jim hooked up the trolling motor and then started up the outboard. That's when I had to step into the boat. And that's when I started to get nervous. Stepping down into that little boat rocking on the water is like stepping onto a big puddle of jello. I envisioned falling into the river. But I didn't. I successfully got in; I sat down; I held onto the sides of the seat. Jim powered up the motor and aimed for the river proper--the river that was choppy. Although I was in a life jacket and I am a good swimmer, I was very uncomfortable as every little wake or wave came at us. I wasn't worried about getting a queasy stomach; I was concerned that the boat might swamp! The chop was mostly caused by the tide coming in, but the waves made me anxious. After about 20 minutes or so, Jim turned around and we made our way back to the boat ramp. That's when the "fun" began. I'm not sure how other people get their boats onto the trailer. I think someone backs the trailer down the ramp, and then someone else stays in the boat and drives/floats it up onto the trailer. Jim and I did it differently. Since this is a little boat, he told me to hold onto the rope and pull it up onto the trailer. Fine, except that the rope is tied to one side of the boat, and the current kept turning the little tyke around! However...we persevered. After Jim backed the trailer into the water, I (and then he) finally got the boat mostly onto the trailer. Unfortunately, when he put the car in gear and pulled up the ramp, the boat slipped off. We tried again. Same result. He thought I should pull and hold better. Finally, I told him to do it, and I took over the backing-up responsibility. I've never backed the SUV with a trailer attached to it. I don't think I did too badly, except that it was hard to see where I was, especially since our backup camera doesn't work. Two more attempts (and an offer from a stranger for help, which Jim declined, saying that I "needed the practice," and we finally succeeded. Only after we got home did we realize that once the boat had floated onto the trailer we should have used the winch hook to keep it on the trailer as we pulled it out of the water! I guess that is what is called a learning experience. We are still married, and we still plan to use the boat. I suspect I will get over my unease, with time, especially if we find a ramp that is on a creek, not the river, where the water is calm and we remain close to shore at all times. And I also suspect we will become adept at putting the boat both into and out of the water, on the first try. In the meantime, Jim decided that the 3.5 hp motor would be OK to use if only one person were in the boat, but with two of us, it is under-powered. So he is working on the Monkey Ward motor to see if he can make it go forward as well as in reverse. I have faith that my Mr. Fixit will find and fix the engine in short order.